Anyone who knows me knows that I am a sucker for cold things like sorbet. It’s just so refreshing and delightful. And anyone who knows the kind of winter I had (blah) can bet their money that I’m looking for any signs of spring and summer. So when I saw the beautiful organic strawberries at my local market I went crazy and bought a ton. Combined with the bucket of organic lemons in my fridge this honey sweetened strawberry lemon sorbet was meant to be. Sorbets are really easy to make. The trick is to taste as you go. Since any fruit you choose will vary on its sweetness, don’t leave this step out! But other than that this is a super simple and refreshing way to say “good bye” to winter and “hello” to warmer, brighter, beautiful days! I am a lover of almost any cold delicious dessert and this honey sweetened strawberry lemon sorbet for sure makes the list. 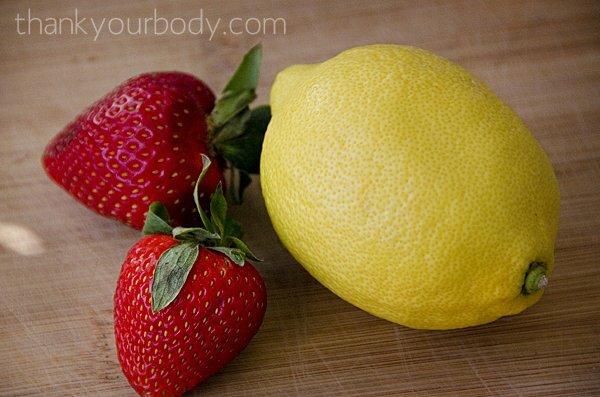 Pour lemon juice, zest, and strawberries into food processor or blender. Blend until well combined. Add honey one tablespoon at a time, mix, and taste. Continue to add until it's at your desired sweetness. Add salt. Blend until well combined. Put in refrigerator until well chilled. *I love my ice cream maker attachment for my kitchen aid. Seriously, it’s awesome. But if you don’t have an ice cream make your can just freeze the blended mixture in an air tight container. It won’t be quite as smooth, but it will still taste good. What’s your favorite thing to do with strawberries?